Professional Edition was engineered to support development projects that target the Web (including ASP.NET AJAX), Windows Vista, Windows Server 2008, The 2007 Microsoft Office system, SQL Server 2008, and Windows Mobile devices. The number of platforms that developers must target to meet business needs is increasing rapidly. 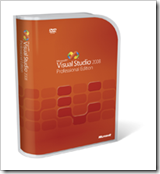 Visual Studio 2008 Professional Edition provides the integrated toolset for addressing all of these needs by providing a superset of the functionality available in Visual Studio 2008 Standard Edition. Today’s developers face the challenge of targeting a broad range of platforms and crafting applications that quickly deliver value to the business. Integrated designers and language features in Visual Studio allow developers to build the connected applications demanded by today’s businesses while taking advantage of the .NET Framework 3.5 to reduce development time. Develop compelling solutions that leverage the user experience and capabilities of the 2007 Microsoft Office system and Windows Vista®.